Although Emmi has lived in Chicago for two years, she finds it hard to love her adopted city. As a German immigrant n the early 1870s, she’s often teased by her America-born peers. But when the Great Fire breaks out on October 8, 1871, Emmi and her enemies find themselves braving the smoke and flames together. Can Emmi and the others survive the danger to escape the burning city? 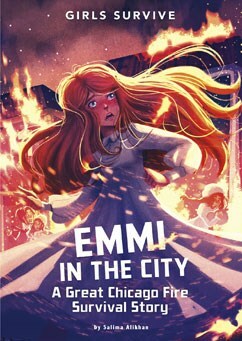 Readers can learn the real story of the Great Chicago Fire from the nonfiction back matter in this Girls Survive story. A glossary, discussion questions, and writing prompts are also provided. Pelican PublishingThe Pied Piper of Austin – The people of Austin, Texas, had a serious problem. Everywhere they went, the bats went, too. In this regional adaptation of the popular fairytale, the Pied Piper of Austin helps the city get its bat situation under control. Pelican PublishingRocky Mountain Night Before Christmas is the classic Night Before Christmas tale with new Christmas magic and a Rocky Mountain twist. When one Scrooge of a rancher mistakes Santa Claus for a cattle thief and refuses to let him go free, Santa’s Christmas Eve ride is delayed. It’s up to this cowboy of a Kris Kringle to save Christmas once again. Sylvan Dell PublishingPieces of Another World is the touching story of a father and child’s nighttime excursion to watch a meteor shower. The readers feel as though they too, are in the middle of the field watching the tiny bits of other, distant worlds, blazing past our own. Salima Alikhan has also done educational illustration for a variety of clients including McGraw Hill, National Geographic Learning, and Harcourt, and is currently writing a chapter book for Reycraft Books.